Trump's energy speech today: substance or sound bites? BISMARCK, N.D. -- North Dakota Attorney General Wayne Stenehjem (R) has a long list of complaints when it comes to efforts by the federal government to regulate energy production in his state -- rules on power plant emissions, water protections and regulations on hydraulic fracturing -- and he's brought lawsuits against all of them. 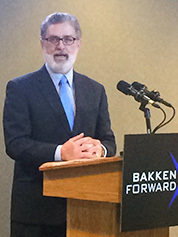 In a speech to the Williston Basin Petroleum Conference here yesterday, Stenehjem touted his record of more than 60 lawsuits over what he views as federal overreach -- asserting that he's filed more lawsuits bucking environmental regulations than any of his fellow attorneys general currently in office -- and successes like judicial stays against the Clean Power Plan and the Waters of the U.S. rule. But Stenehjem, who is running for governor this year, acknowledged: "We cannot hold them off in court forever." That's why North Dakota officials are hopeful that the eventual successor to President Obama will roll back some of those proposed regulations -- a task Stenehjem acknowledges that neither former Secretary of State Hillary Clinton nor Vermont Sen. Bernie Sanders is likely to take up. Instead, those hopes fall to presumptive GOP presidential nominee Donald Trump, who is expected to detail his energy platform for the first time in a speech at the conference here today. But while Trump has utilized North Dakota Rep. Kevin Cramer (R) as an energy adviser to his campaign, it remains to be seen exactly what Trump will discuss in his address at the Bismarck Event Center (Greenwire, May 19). "I don't think he'll drill down to specific policies," Cramer said yesterday, noting he had not seen a transcript of Trump's prepared remarks but expected a 40-minute speech focused on oil and gas, as well as on foreign policy. A Trump spokeswoman declined to discuss Trump's speech with E&E Daily earlier this month. Cramer added, "I expect him to touch on general high-level issues and speak more specifically on oil and gas." He explained that Trump could address oil exports as well as the importance of domestic energy production to national security. While Cramer said he would ideally like Trump to state that his White House will "roll back a bunch of these regulations that are killing the industries and putting America at a global disadvantage," he added: "I'm confident I'll like the high level, whatever it is." Earlier this month, Cramer provided Trump with a four-page paper outlining his thoughts on an "all of the above, America-first energy policy" that promotes a "states first regulatory regime," as well as reforms to the energy tax code to treat all sources equally, such as writing off development expenses. Cramer has said the document discussed rolling back the Clean Power Plan, the Obama administration's effort to reduce carbon emissions from existing power plants. Cramer also suggested targeting new source performance requirements, methane and stream buffer zone rules. "I find him to be quite intellectually curious and really quite interested. So my little bit of time with him has been really rewarding from that standpoint," Cramer said, pointing to Trump's discussion of the Waters of the U.S. rule, which would redefine which streams, rivers and wetlands receive automatic protection under the Clean Water Act. Cramer voiced hope Monday that Trump will address WOTUS on the campaign trail (E&E Daily, May 24). North Dakota Department of Mineral Resources Director Lynn Helms said yesterday that he hopes Trump relies on Cramer's advice and that he would like to see the Republican offer details on his policy. Lynn Helms (above), director of North Dakota's Department of Mineral Resources, said he hopes Donald Trump relies on Rep. Kevin Cramer's advice. Photo by Jennifer Yachnin. "I hope to hear the influence of Kevin Cramer in Donald Trump's speech," Helms told reporters at a short news conference yesterday. "I hope to hear the North Dakota-centric, more cogent federal energy policy discussion: Not so much sound bites but actually beginning to formulate a concept of what a proactive federal energy policy might look like in terms of how would a Trump administration regulate this industry, how would a Trump administration deal with exports like the [liquefied natural gas] exports, how would a Trump administration deal with competition with OPEC and Iran and Russia." While Trump has previously suggested he would dismantle U.S. EPA and oppose a carbon rule (Greenwire, March 30) and has dismissed climate change as a "hoax," he has otherwise not produced a cohesive energy policy. Helms later told E&E Daily that he would specifically like to see Trump address a host of federal policies including the Clean Power Plan and the Bureau of Land Management's rule aimed at reducing venting, flaring and leaking of methane from roughly 100,000 wells on federal and tribal lands. But Helms said the top items on his wish list would be for Trump to address WOTUS and BLM's hydraulic fracturing rule, which would regulate well construction, wastewater management and chemical disclosure for fracking on public and tribal lands. Under separate judicial actions, the Clean Power Plan, WOTUS and BLM's fracking rule have all been stayed in federal courts. In an interview yesterday, Stenehjem said he hopes Trump addresses North Dakota's economy "in particular" but said he would be happy for the presumptive Republican nominee to tackle any of the federal regulations his office has objected to in court. "Every day I come to work and it just seems like there's something new," Stenehjem said. "The Waters of the U.S. is perhaps one of the most pernicious, but the so-called Clean Power Plan is something that will put an end to our generation of electricity with coal here in North Dakota, so that's very important to us, as well." He added: "It's hard to pick one that's important. I'm sure he'll have plenty of time to talk about all of them." Environmentalists remained less optimistic about the content of Trump's speech, however, pushing back against the idea that Trump will address specific policies. "If it follows what he's been saying on the campaign trail, the plan will be short on details but filled with ideas that would hurt our country's economy, health, safety and security," California billionaire environmental activist Tom Steyer said in a news conference yesterday organized by his NextGen Climate political action committee. "The Trump agenda is only going to make America great again for corporate polluters and special interests." NRDC Action Fund President Rhea Suh, 350 Action Executive Director May Boeve and Sierra Club Executive Director Michael Brune echoed Steyer's criticism. "Donald Trump has not proposed any plan to tackle the climate crisis. In fact ... most days, he won't even admit that it's happening," Brune said. He later added: "The bottom line is that Trump has already been telling the fossil fuel industry whatever they want to hear in spite of reality, and we should be expecting more of the same tomorrow." Back on Capitol Hill, Speaker Paul Ryan (R-Wis.), who rejected a report yesterday that he was close to endorsing Trump, said his priority is developing a policy agenda that Republicans can run on this fall. Ryan will begin unveiling that agenda when lawmakers return from next week's recess in a series of detailed policy papers. He said those proposals, in the works for five months, are being spearheaded by the authorizing committees with input from the entire GOP caucus. Ryan said the proposals would focus on six "big ideas" that he believes all Republicans can get behind and then use to paint contrasts to Democrats. Those proposals are: growing the economy through a tax code overhaul, eliminating regulations, strengthening national security, repealing the Patient Protection and Affordable Care Act, addressing poverty, and putting the legislative branch on more equal footing with the executive branch. The poverty proposal will be the first out of the gate, with the subsequent five plans to be offered over the month of June. The timing suggests Ryan is aiming for them to form the backbone of the platform the party adopts at its political convention in July. "This agenda is not an exhaustive list of the things we believe as Republicans," he said. "But these are the big ideas that unite all Republicans and address the nation's priorities." Ryan said his goal is to offer "bold ideas" that could only be done with a Republican president. He declined to offer specifics on the plans, although in the past GOP leaders have said energy independence would be addressed in the proposal for creating economic growth. While stressing his staff talks on an almost daily basis to the Trump campaign, Ryan acknowledged there would be policy differences between himself and the presumptive nominee. Ryan, a self-described movement conservative, acknowledged that he and the populist Trump come from "different wings" of the GOP. He added, "The question is if we are going to unify, can we figure out what is the common foundation that ties all of these wings together? That's what we are working on." In addition to Ryan and Trump's agenda, the Republican Party is developing its own platform ahead of the GOP presidential convention in Cleveland in July. Sen. John Barrasso (R-Wyo. ), who earlier this week was named chairman of the Republican National Convention platform committee, told E&E Daily yesterday it would be "a robust platform on energy and all-of-the-above energy" (E&ENews PM, May 24). That platform, which Barrasso said in previous years has included sections on constitutionality, foreign policy, jobs and the economy, will be compiled by 112 members, including one man and one woman from each state, the District of Columbia and U.S. territories. Asked whether the platform will be coordinated with the Trump campaign and Ryan, Barrasso responded, "It's going to be driven by the members of the committee, it's going to be driven by the delegates to the convention." Coincidentally, Trump's son, Donald Trump Jr., was in Washington, D.C., yesterday, meeting with about 15 members of Congress at the Capitol Hill Club. The younger Trump, an avid sportsman (E&E Daily, May 12), told lawmakers he was more likely to be "in a deer stand at 5:00 in the morning than in a night club," according to Rep. Lou Barletta (R-Pa.), who has endorsed Trump and was one of the meeting participants. "It was surprising to some of the members who would not picture Donald Trump's son being such a sportsman," Barletta told reporters after the meeting. Trump Jr., the 38-year-old executive vice president of the Trump organization who has hunted all of the world, has said he'd like to be Interior Secretary if his father is elected. Barletta said that topic was not raised at the meeting. He added he expects the elder Trump to return "sooner rather than later" to meet with Capitol Hill Republicans. This story also appears in ClimateWire and EnergyWire.